(9.11.11) Joel McGrew was born on March 12, 2010 and appeared to be a healthy newborn baby boy. However, within 5 hours, doctors knew something was dangerously wrong. Joel was diagnosed with four heart defects, the worst of which was transposition of the great vessels (his pulmonary artery and his aorta were switched), which seriously deprived Joel's body of the oxygen it needed. At just five days old, Joel underwent open-heart surgery, which lasted six hours. Although the surgery was successful, Joel's condition did not get better. His entire body became very swollen and Joel experienced seizures, brain bleeds, hydrocephalus, DIC, and a stroke. Joel's body was shutting down so doctors re-opened his chest in order to relieve pressure and to be ready in case another emergency surgery was needed. Joel spent an entire week with his chest open. Despite incredible odds, Joel fought hard to stay alive. At two and a half months, he received a tracheotomy tube and a ventilator in order to help him breathe, and had a shunt installed in his head in order to drain excess fluid. All together, Joel spent 95 days in the ICU, requiring 14 different medications per day, in addition to requiring the care of six different specialists. Since birth, Joel has endured 11 surgeries. 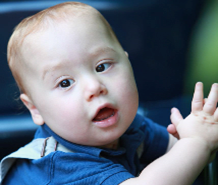 Now, at 17 months old, Joel McGrew is a living example of a miracle. His trach tube is out, and although he is fed through a feeding tube, he is starting to learn to eat by mouth. He has been weaned off of all medications and doesn't have to see his specialists as often as he used to. As a result of all that Joel has been through, he does have some developmental delays. His speech is delayed and although he can't walk or stand on his own quite yet, Joel shows determination when it comes to getting where he wants to go. In October, Joel will undergo two more surgeries, one to help correct an eye problem, and the other to properly close his tracheotomy hole. Joel has been through more in the first years of his live than many people face in a lifetime. Joel's miraculous story and his continuing journey are an inspiration to all who hear it.